Frank " Satan" Brewer one of the 20th Century's greatest midget drivers and a hell of a nice bloke. They called him "SATAN" because he drove like the DEVIL ! 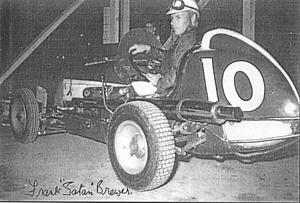 Word reached Australia on Saturday the 9th June 2001 of the passing of Speedcar legend, Frank "Satan" Brewer at the age of 94. He died getting ready for bed in Phoenix, Arizona, USA. on Friday the 8th of June. (USA time). Frank had spent the last 50 years travelling between Australia , New Zealand and America. 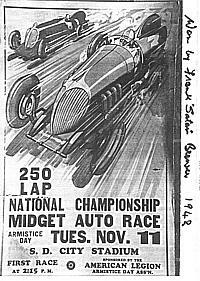 Born in Christchurch, New Zealand in 1906, Frank began his racing career in an old Chevrolet sedan and later progessed to a Chev engined midget # 72. 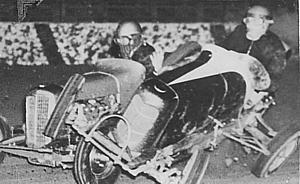 The fans soon took to him and Frank Zambucka, who was a starter at Western Springs Speedway in NZ nicknamed Frank, "SATAN" because he drove like the DEVIL. That nickname stayed with him for the next 62 years. 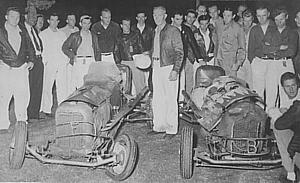 After being enthused by a group of travelling American midget aces in NZ in the 1937-38 season he packed his bags at the end of the next season 1939, and set off for the States to try his hand at midget racing, the rest is speedcar history. Frank became famous and admired by all in the States as one of the toughest and most competitive drivers to ever race in the USA and he became a specialist in the long distance events. 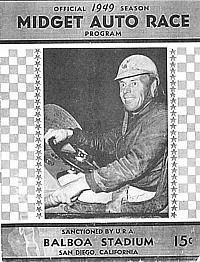 Driving V860s his longest event was a 250 lapper and his most memorable was the 150 lap Grand Prix in San Diego in 1940, he won both. 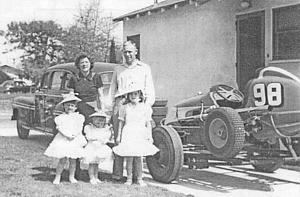 He did all the work on the V860s himself and was one of the only mechanics to be able to get them to run cool enough. 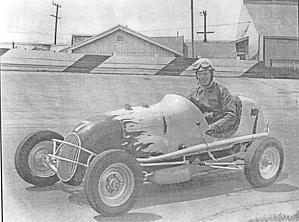 He came to Australia in 1948 with two V860 midgets, one painted cream with red flames on the bonnet( to be known as the Flame Car) and numbered 48 and the other an Eddie Meyer / Kurtis car numbered 10. # 48 was to be driven by Andy McGavin, Bill Reynolds and Fay Taylour as # 18, Werner Greve and Johnny Harvey as # 13 and is now being restored as the Harvey #13. Car # 10 was re numbered # 99, it was blue and white, and Frank ran it very successfully over the years, winning many Championships. 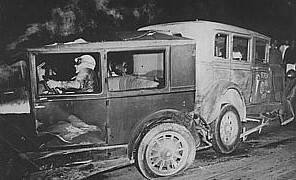 Harry Neale of South Australia drove the car and was unfortunate to lose his life in it. The Dark family bought the car, painted it yellow and red and numbered it # 2 and it became very famous again as the B.E.R.C.O Repco Holden being driven by all of the Sydney "greats" and was finally owned by the Arthurson Family of the A.C.T, in whose hands it still belongs and is run in a restored state with the Vintage Speedcar Association of NSW. 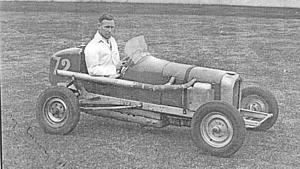 Frank won the NSW midget title in 1950-53 and 54, the Australian midget title in 1950-53 and 54 and the "World" title in 1949 - 50 and 54. I was fortunate enough to see him win most of these titles and I feel more fortunate to have made his aquaintance in his and my later years. He will be sorely missed in the world of Speedway, Thanks for the Memories Frank. 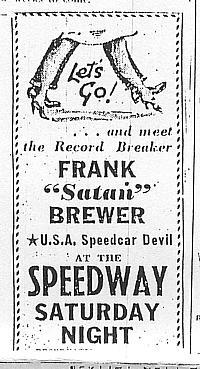 A Pictorial History of Frank "Satan" Brewer. 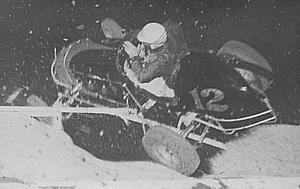 Frank in his first midget # 72 in New Zealand. YES, it's the SATAN in a DEMO DERBY in the US. FANCY THAT ! Margaret (Franks wife), Maureen, Marilyn,Madeline and the Midget. 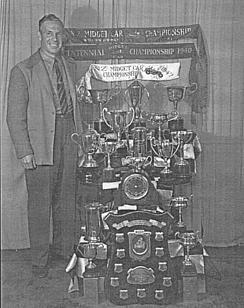 Frank running the Eddie Meyer V860 as nunber 10..
A proud speedcar driver with some of his trophies won in New Zealand. 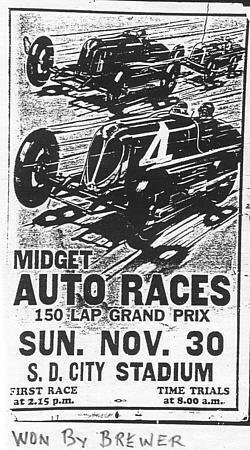 Frank Brewer's first midget race in America at the Neptune track in Alameda, Oakland, California. "Wild" Bill Walbridge rode over Brewer with wheels still spinning under power. This caused a burn on the left arm of Brewer's new leather jacket. Frank had just bought the jacket in San Francisco and he said it saved the flesh from being ripped off his left arm. He wore this jacket for years and it became part of his trademark in Speedway. The girls still have that jacket today, with the burn mark ! Frank having a big "off" in the Jack Gardiner Offy at San Bernadino in the States. Don Farmer's car left , Frank's on right. Frank with helmet in hand. 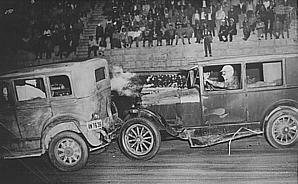 Farmer spun and Brewer threw it sideways to avoid him, Walt Faulkner in Brewer's other car came along and rode over Brewer. Faulkner was taken to hospital to have 26 stiches in his leg. The peak was broken off Frank's helmet in the crash.